Editorial Note: Omar Téllez sits on Moovit’s and Solomoto’s advisory boards and is Moovit’s former president. Prior to that he was part of the Synchronoss Technologies, Inc., executive team. It’s pretty telling that Mark Zuckerberg didn’t choose Beijing, London or Dubai to have the first Facebook overseas town-hall meeting. He chose a place that 10 years ago few people in Silicon Valley knew much about, and much less regarded as a player in technology: Latin America. A lot has changed in this part of the world over the past 20 years. Today, with over six countries worthy of investment-grade debt rating by Fitch and S&P (Brazil, Chile, Colombia, Mexico, Panamá and Perú among others) and a pervasive and ubiquitous penetration of both social and mobile technologies, Latin America is a radically different story, and technology companies that have understood this and learned to play in this turf have reaped generous benefits. Foreign companies, like Facebook, Moovit and WhatsApp are clear examples of this and have profited from it. 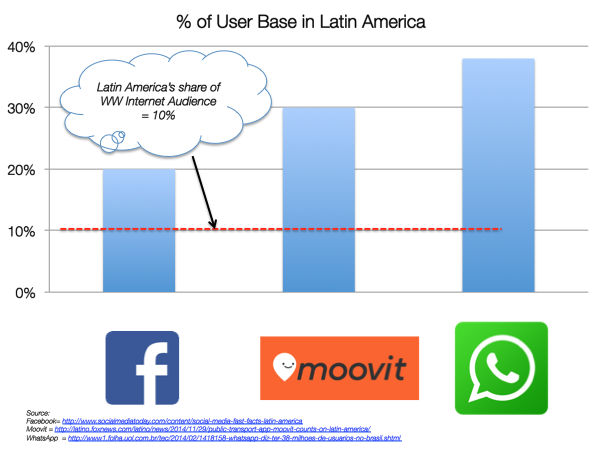 With well over 200 Million users, Latin America represents close to 20% of Facebook’s user base. As reported earlier, Latin America is a key strategic market for Moovit representing north of 30 percent of its base. And when WhatsApp crossed 465 million users, Brazil and Mexico accounted for 70 million users or a whopping 38 percent of its user base. With only 10 percent of the worldwide Internet audience, and less than 9 percent of the gross world product, Latin America could appear to many as insignificant. Yet, shining a spotlight on Brazil, just to highlight one country, gets you a radically different picture. Brazil’s population of 200 million, and over 240 million SIM connections leads it to outperform the world in terms of mobile penetration and carries the highest SIM-to-subscriber ratio (currently at 2.1 to 1). There are at least six things entrepreneurs will have to accept to be successful in the Latin American market — a fascinating yet notoriously tricky region of the world. To say that the wireless industry is a cornerstone of Latin America is an understatement. While in developed countries like the U.S. and Europe, the mobile industry represents roughly around 2 percent of the economy, in Latin America it ranges from 4 percent to 5 percent and, furthermore, it is a very different animal. Comparing the power and clout of a carrier like America Móvil, owned by Carlos Slim, the richest man in the world and active investor in technology startups like Shazam, Mobli, and Fancy among others, with almost 300 million subscribers in 18 countries against that of AT&T with only 120 million can give you a sense of the importance of this sector in Latin America. It is no wonder that Uber’s path to dominance in Latin America, involves a strategic partnership with América Móvil. Interestingly in this case, Uber was willing to share a portion of its LTV (lifetime value) in return for preloading and promotion. Latino wireless carriers get it now more than ever. With the recent partnership with Facebook, Mario Zanotti, senior executive VP at Millicom International Cellular, said that the company has seen 50 percent growth in new data users in Colombia since Internet.org launched there in early January. Commuting times in Latin America rank as one of the worst in the world. It was this dynamic that led Moovit to partner with the local authoritiesand with the largest media players O’Globo to become the de-facto traffic information tool for Brazilians. All around Brazil, people wake up every morning to see the traffic report on their leading TV Station, O’Globo, provided by Moovit and can access the information throughout the day on Brazil’s largest digital portal, Folha de Sao Paulo. Even though it was a very painful experience for those of us with Brazilian heritage, the Brazil vs. Germany semifinal still ranks as the most-discussed single sports game ever on Twitter, generating 36 million tweets. Similarly on Facebook the match generated a very high level of conversation. More than 66 million people had over 200 million interactions and Brazil dominated about a quarter of the global conversation. Should you be thinking that a World Cup was a one-time event for Brazil, perhaps you should Google when the next Fla-Flu game is (Flamengo vs. Fluminense rivalry is analogous to that of the Yankees vs. Red Sox) or check out where the next Summer Olympic Games will be held. Someone once told me that in many ways, Brazil has a Super Bowl every week, and I have to agree with that. Brazilians spend on social media networks more time per month than anyone else in the world. Latin American startups have a canny ability to take a proven business model, and execute like crazy to improve on it. After winning “Best International Startup” in the 2012 Crunchies, Peixe Urbano the online to offline (O2O) daily deal company, went on to grow to more than 25 million users and 30K merchant partners, and recently sold control to China’s Baidu, the No. 2 Internet search engine in the world, for and undisclosed amount. While it’s easy to be amazed by the growth that taxi app companies such as Easy Taxi and 99Taxis have driven in Brazil, after raising hoards of money, it’s difficult not to be impressed by Tappsi. With a focus in Colombia, Perú and Ecuador, Tappsi has easily surpassed 1.3 million bookings per month with only $600K in seed funding. With over 45 countries, 620 million people, multiple cultures, languages and dialects, Latin America is a very diverse region. Referring to Latin America in singular form, and taking a cookie-cutter approach without considering the intricacies and complexities among its countries would ignore its rich diversity and likely position you for failure. What works in Brazil will likely not work in Mexico or Colombia. Sharing your Chilean success case with Argentineans will likely do more harm than good since after many wars and unsettled territorial disputes there is deep distrust among them. There are a ton of things that technology entrepreneurs could learn about Latin America, and addressing head-on the challenges that this region presents is key. The uphill battles of doing business in these markets due to bureaucracy and corruption, combined with the high costs of basic services such as telecommunications are significant, and could definitely slow you as you figure it out. It’s no secret as to why LATAM is so important for Zuckerberg. Individually, Bogotá, Sao Paulo, México City, Santiago and Buenos Aires have more users than New York or L.A. With smartphone penetration increasing from about 23 percent today in Latin America, to roughly 50 percent by 2018, the impact that this region will have on social, mobile and local startups will be enormous. However, changes in skills and tactics, and partnerships will be necessary to capitalize and win in this market and reap the benefits like others have.